Home > Inspired by Pop Culture> got? > got bins? Don't forget your binoculars -- anything but that! 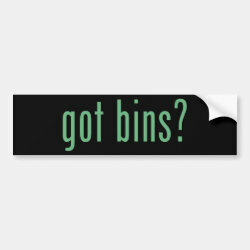 This fun spoof text design simply reads "got bins?" Inspired by the "got milk?" campaign, this makes a great gift idea for any birder (especially if you know one who is prone to forgetting the most important tool of birding).